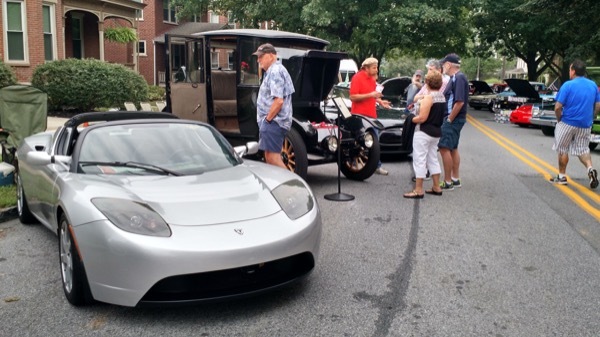 National Drive Electric Week Kennett Square (Mushroom Festival) was hosted by MD Volt Inc. and Eastern Electric Vehicle Club (EEVC) in downtown Kennett Square, PA on Broad Street at the 30th Annual Mushroom Festival Antique and Classic Car Show. The highlight of the event was a 1916 Rauch and Lang Electric Car driven and displayed by Jeff Pollock, volunteer/driver for the Marshall Steam Museum (about 7 miles away). We reached a large number of people walking through to get to the main festival area. Also unique to the event, were a 2008 BMW Mini-E (on lease as part of an ongoing vehicle-to-grid (V2G) demonstration project by The University of Delaware) and a Chevrolet S-10 EV pickup with a bed that could raise to show the lithium batteries below. On breaks, EV owners walked the festival, shopped, and got tasty mushroom food items, like fried mushrooms, mushroom soup and more, making it an event fun for the whole family. 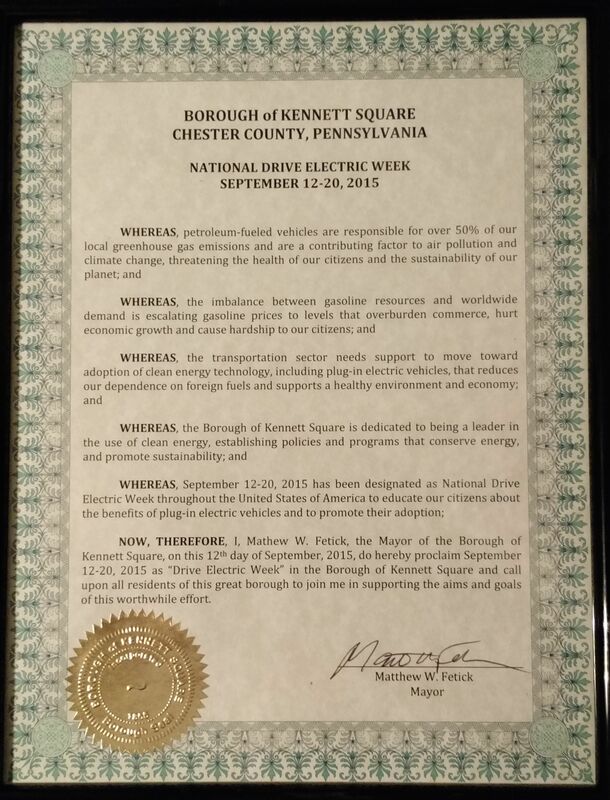 A proclamation was delivered by Mayor Matthew Fetick's office. photo by: MD Volt Inc.
From left to right, Ronald Whittaker, owner 2010 Tesla Roadster; Jeff Pollock, volunteer/driver, 1916 Rauch & Lang Electric ( Marshall Steam Museum); David Bennett (grey shirt/hat), owner 2013 Tesla Model S; Todd Wilson (plaid shirt), owner 2008 BMW Mini-E; and other guests of the 30th Annual Mushroom Festival. Join us for one of the area's largest National Drive Electric Week outreach efforts in the region, as 2,000-3,000 people are expected to walk through the Mushroom Festival Car show this year, with hundreds of thousands of people expected to attend the Mushroom Festival over the weekend. Owners bringing an EV will meet at the Longwood Gardens parking lot at 8:00 AM and drive to the event together at 8:30 AM sharp, so we can park near each other. EV Owners: Click here for registration and payment. National Drive Electric Week EV owners will be meeting to display at the 2015 Antique and Classic Car Show at the 30th Annual Mushroom Festival in Kennett Square, PA.
Also on display will be a 1916 Rauch and Lang Electric Car. Group drive from Longwood Gardens to the Festival Car Show (see map below); Each EV owner will receive a Drive Electric Car Flag. Sponsored in part by MD Volt Inc. Registered attendees report 436,640 electric miles driven.